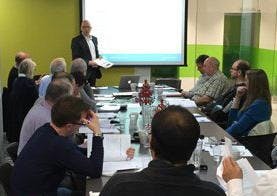 The Legionella Risk Assessment Training (ABBE Level 2 Award Awareness of Legionella) is designed for individuals who wish to carry out Legionella Risk Assessments and gain a recognised qualification. This course includes a background into Legionella and the legislative requirements. Candidates will gain an understanding of hot and cold water (domestic) systems, control measures and risk assessment software demonstrations, using eTech's Legionella Assessment iPad App. The course comprises tutorials, discussions, workshops and short knowledge tests. Candidates must be computer literate and own or have access to an iPad.